This kitchen, designed by Mick de Giulio and featured in House Beautiful is a stunner, no doubt about it. Bright white walls, ceiling, cabinets and marble countertops are anchored in place by a rich, walnut-stained floor as well as the antique and traditional furnishings. I often find it amusing that we've taken the design principles of what would have been basement/ground floor, working kitchens in the grand houses of the Victorian and Edwardian periods - the long prep islands, crown-like vent hoods, black and white tile - and raised them to the most luxurious of heights; to the room most families spend the majority of their time. But I'll take it, when do I move in? Love the cozy seating area off to the left of this image - I couldn't find any shots of this but I'm imagining it's the perfect place to sip coffee in the morning. 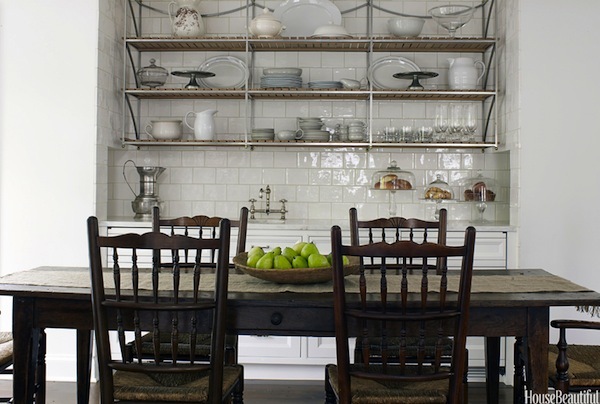 The contrast of the dark, antique farmhouse table & chairs with the bright white of this kitchen is killing me. And let's not forget to mention those shelves in the background or how beautifully they're styled.